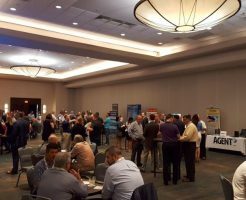 The annual ACCC user conference hosted by Axis Communications attracted attendees to Fort Lauderdale, Fla., for an agenda chock-full of workshops, keynotes, networking and more. 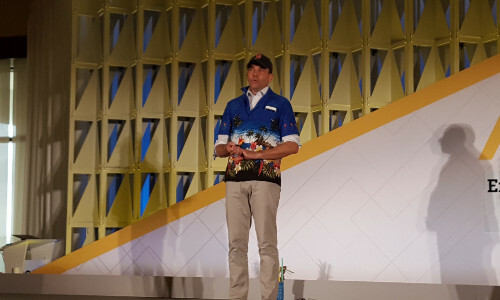 Axis Communications' Fredrik Nilsson, vice president, Americas, outlined “5 Dimensions of Insight and Opportunity for 10 Years of Success” during the ACCC opening keynote. 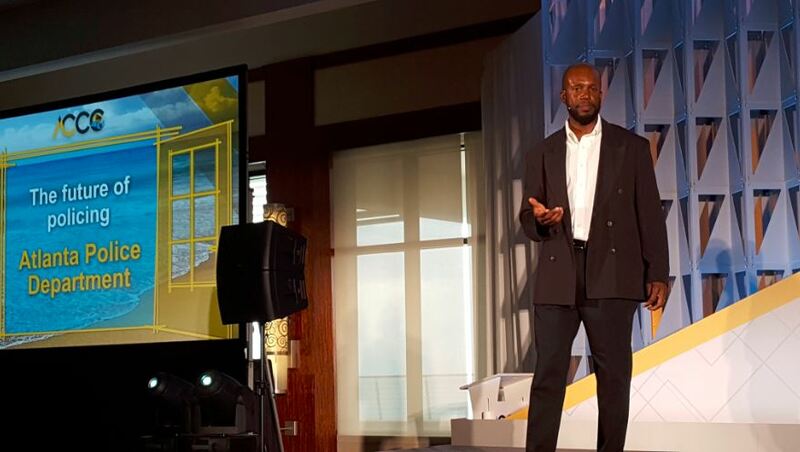 FORT LAUDERDALE, Fla. — The Axis Communications ACCC 2018 user conference, held recently here at the Marriott Harbor Beach Resort & Spa, offered “expanding insights and opportunities” as its theme. This year one message rang loud and clear: it’s time for security dealers to get into IP audio. A pioneer in IP video surveillance, the Swedish company enumerated reasons why the market is ripe for security- and business-related audio installations, aided by Axis’ super-streamlined approach that involves fewer pieces to install but with the software-driven flexibility to provide scalable and retrofittable solutions. That was just one key piece to the jam-packed 13th annual conference that offered two full days loaded with keynote presentations; various hour-long workshop sessions offering both technical and organizational focused education; partner technology exhibit showcase featuring nearly two dozen vendors; partner appreciation awards banquet; charity work; and plenty of networking time for the roughly 400 attendees. Nilsson came onstage sporting a Boston Red Sox cap, perhaps not only fittingly representative for the company’s nearby Chelmsford, Mass., U.S. headquarters but as a symbol of such team-oriented success as the soon-to-be World Series champions took the field for Game 1 against the Los Angeles Dodgers that night. Those five dimensions mentioned in the presentation title were detailed by Nilsson, Sr. Sales Director Larry Newman and Sr. Director, Business Development Solutions & Services Scott Dunn as: the human dimension, technology dimension, new market dimension, service dimension and social responsibility dimension. 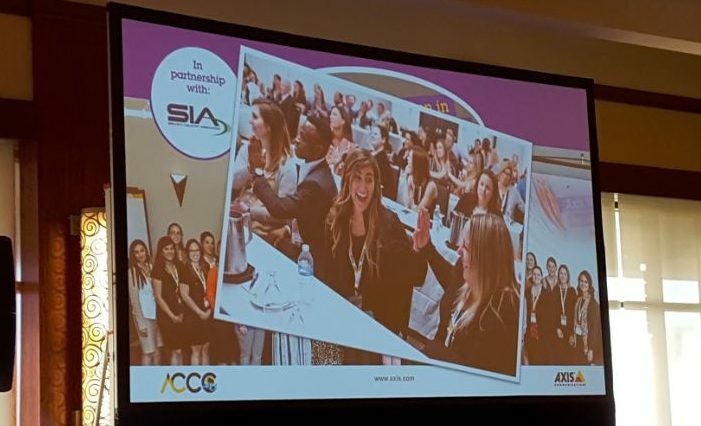 One important piece noted for vision of next ’10 years of success’: more gender diversity in security industry to improve 10%-15% estimated female numbers; Axis worked with SIA on a Women in Security Summit in June. Regarding the first one, the women in the room were asked to stand up to drive home the point that though there’s a roughly 50/50 population split between males and females the security industry continues to lag in gender diversity. To help propel that potential part of the future success equation, it was noted that the company held its first Axis Women in Security Summit back in June, in partnership with the Security Industry Association. Dunn added that Axis has started education programs geared toward attracting younger folks into the industry as well. The new markets dimension that stands to benefit from that R&D investment includes not only the aforementioned IP audio ecosystem, but also solutions for commercial buildings and in particular aspects such as Internet of Things (IoT), IP intercoms, thermal camera technology and radar. As for the social responsibility angle, Axis has worked to reduce its product packaging, cut carbon footprint and implement greener technology, including efforts such as eliminating PVC in all product and optimizing logistics. One expected byproduct to sharing this dimension with dealers is the anticipation of attracting more talent as the younger, more eco-minded generation seek out companies with mindsets that match their beliefs. On the second full day of the ACCC, attendees and Axis personnel participated in stuffing hundreds of school supply packs for underprivileged children as an activity guided by industry charitable organization Mission 500. 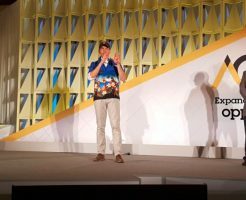 Expanding upon much of what attendees heard during the opening keynote, the full days’ morning and afternoon workshops pinpointed more specific opportunities and insights with a mix of market- and technology-specific presentations. Sessions led by Axis personnel and other guests included: “Diversify and Profit: Adding Audio Solutions to Boost Your Bottom Line”; “Preparing for Emerging Cybersecurity Threats With the Right Tools”; “Making Schools Safer With Standards-Based Integration”; “Moving Beyond Traditional Healthcare: How Technology is Changing the Industry”; “Work Smarter, not Harder: Secrets for Maximizing Profit and Efficiency”; “Talent Management Best Practices for the Security Industry” and more. The IP audio-centric workshop certainly energized and enticed attendees. Hakan Hansson, Axis’ global product manager, audio, and Magnus Zederfeldt, global biz development, audio, kicked things off by having everyone stand and move their arms up and down in a “raise the roof” manner to “pump up the volume, because that’s what we want to do with audio,” enthused Zederfeldt. The manufacturer sees potential IP audio profits coming from two applications: security and business. 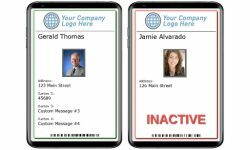 The former is marked by live spoken responses to incidents or alarms in monitored video systems, and prerecorded or scheduled responses triggered by a security application. The latter, “really a new field for Axis and most of you, I’m sure,” said Zederfeldt, covers public address and paging, and background music for businesses. 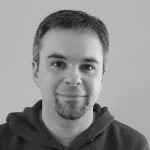 Hansson noted that there’s a competitive landscape in the addressable audio market, but a differentiator for Axis is that it’s a total IP solution; “We mean networked all the way – a software platform, network devices and that’s it,” he said. 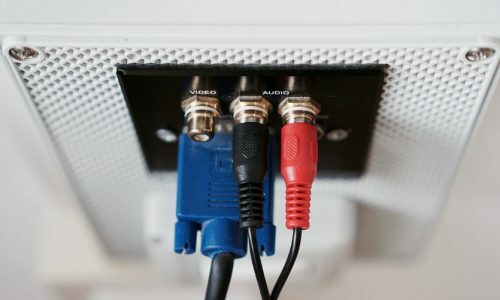 The network solution enables dealers to more easily unify those audio applications such as paging and background music in one system that’s driven by a software platform that users can manage volume, control what content goes to what zones and even have health monitoring” for each component through Axis’ Audio Manager. For a simplified system via IP, Axis offers design tools to help dealers get into audio for security/business. For a typical design and build system, Hansson explained that in an analog audio setup the customer needs to provide a lot of information from day one to enable aspects such as subzones or muting music when paging occurs; the system itself can take up a lot of equipment rack space; and it does not lend itself to simple tweaks or expansion. Sample topology would likely include microphones, audio matrix switcher, equalizer or tone controller for each zone, multiple power amplifiers depending on the number of zones, passive loudspeakers and source content. An all-network audio topology essentially whittles the design down to two-way SIP microphone, active speakers (Axis offers horn, ceiling and cabinet models), software management to configure zones, and in Axis’ case a network “bridge” encoder/decoder to add analog content sources if so desired (Axis already partners with a digital content provider for background music). 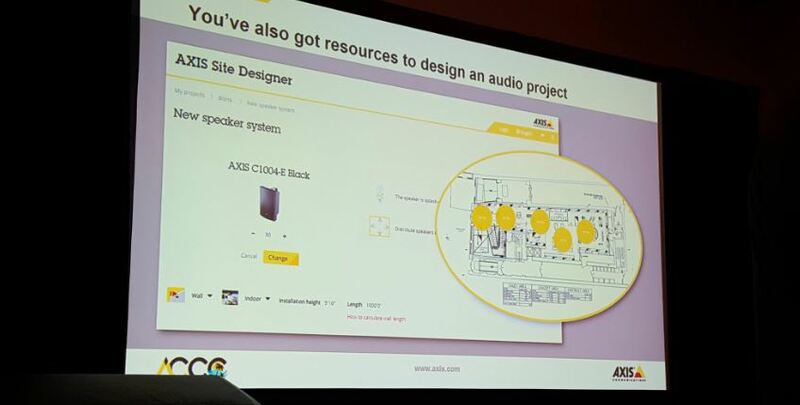 Axis’ enterprise Audio Manager platform can handle hundreds of zones. Zederfeldt offered several use cases for both security and business applications in which Axis dealers have helped customers with protection, efficiencies and customer service aspects thanks to audio. For instance, one car dealership deters intrusion without involving law enforcement more than 90% of the time via recorded application added to its virtual guarding cameras; a banking customer in Italy has reduced ATM fraud by 30% in cases involving people looking over the shoulders of those using the machines, with an audible “keep your distance” warning triggered by the ATM camera; and a retail chain measured an 85% reduction in shrinkage over a three-month period after it added a message to an area with a 360° camera letting potential shoplifting dwellers know “someone will be there shortly to assist you” – and increased sales 20% thanks to better customer attention. “You can use IP audio for a lot of things, it’s really open to creativity,” Zederfeldt said of how dealers can pitch customers. Atlanta Sr. Police Officer Thomas Sutton Jr. outlined steps taken for city’s Video Integration Center & evolution of Operation Shield to share resources among PD, businesses, responders etc. 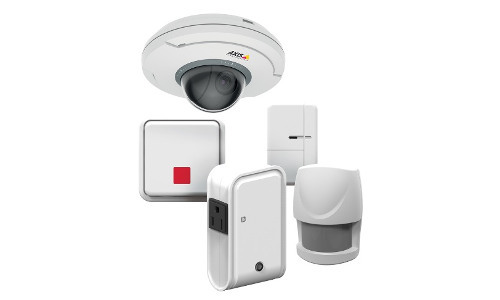 Of course, Axis is foremost a video surveillance manufacturer, and one of the most prescient ways products are being integrated in today’s evolving security market is with municipalities. On the second full day of ACCC Axis brought in representatives from the cities of Atlanta and New Orleans to highlight the progress of how cameras are being integrated with VMS and PSIM solutions in those cities to do much more than assist in crime deterrence and investigations. Troy Galloway of Renew Atlanta, an infrastructure improvement program for the city, detailed projects in which cameras at intersections throughout the city are working in tandem with smart traffic apps to feed real-time information back to a centralized operations center and facilitate things like proactive road maintenance, and traffic light emergency vehicle signal preemption so signals turn green for faster response times. “On average if you can save one minute in travel time, you’re much more likely to save lives,” he said. Meanwhile, the Atlanta Police Department and its Operation Shield Video Integration Center have been working over the past several years with private businesses to federate cameras under the department’s PSIM (which runs on top of the VMS that manages the APD’s own cameras) so call takers at the VIC can use real-time intelligence and video footage close to an incident in progress, prioritize calls that come in, have alerts set for certain activities, etc. Senior Officer Thomas Sutton Jr. talked about how camera technology has evolved with improved resolution, and that the next steps involve adding more data collection and features such as more license plate readers to further aid VIC staffers as well as allow the APD to continue to augment Operation Shield. A similarly cooperative venture is more nascent in New Orleans, where a public/private partnership initiative began after incidents following college football games in 2016 and expanded as a citywide public-safety endeavor centered on the city’s Real Time Crime Center. Technology that includes Axis cameras, Genetec federations and BriefCam analytics patrols much more than potential criminal activity, explained Ross Bourgois of the Office of Homeland Security and Emergency Preparedness for the City of New Orleans. “It was a deliberate idea to have the Crime Center serve all aspects of public safety and not just police, fire, EMS – it’s used by the department of public works, sewage and water board, parks and parkways department that handle downed trees during weather event; so it’s not just myopic to law enforcement,” he explained. Cameras are deployed to monitor and deter illegal dumping; trigger feeds from flood water notifications at critical underpasses; keep tabs for businesses along the Mississippi River port; use low-light capabilities to watch over dark greenways and parks; and much more. “The goal is it’s the 21st century neighborhood watch, it has potential to do some really cool things,” Bourgois said. View the slideshow above for more insights and images from the event.